The Imaginarium is heated and cooled by a geothermal ground-source heat pump system. The system takes advantage of the relatively constant deep earth temperature by recirculating water and bringing it into our building where it is then further heated or cooled to the room temperature desired for people by the ceiling-mounted heat pumps. There are (16) 320 ft deep vertical wells in our geothermal system, (13) of which are beneath the Imaginarium rear parking lot, and (3) of which are beneath the building floor. Each well has a pipe “loop” (a pipe that goes down to the bottom of the well, turns, and comes back up to the top of the well making contact with the earth the entire way). 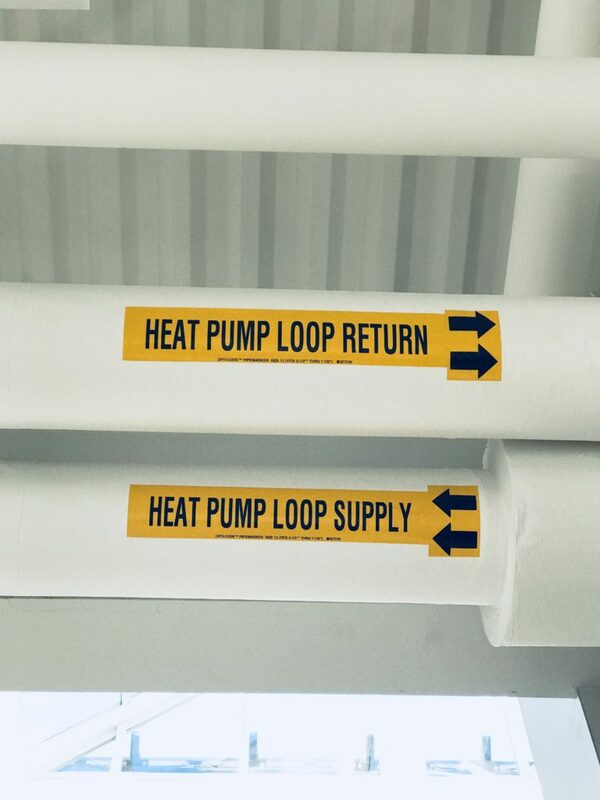 These pipes are networked, grouped and fed into The Imaginarium Mechanical Room, then fed to the building’s ceilings where they connect to the ceiling-mounted Climate Master heat pumps. When we are in heat mode, we pump the water from these pipes which have absorbed the earth’s heat and enter the building at approx. 52 degrees. The Climate Master heat pumps then transfer the heat from the water in these pipes into the warm air that blows into our rooms. When we are in the cooling mode, we reverse the process; The Climate Master heat pumps transfer the heat from our rooms back into the pipes and send it back to the earth for cooling. We use less electricity (approx. 1/5) of a traditional HVAC system because we only need to heat/cool the difference between the desired room temp and incoming water temp (i.e., 52 degrees to 72 degrees). Traditional systems have to use energy to close the temp gap between desired room temp and outdoor air temp (i.e., 22 degrees to 72 degrees). We use electricity to operate the system and are not burning fossil fuels. Since we expect to generate all the electricity we need on site, our greenhouse gas emissions will be essentially zero. Visitors can LEARN MORE about geothermal heating and cooling by watching the “Geothermal Heating + Cooling 101” video in our ECO lounge.